It’s one of those shows everybody watched but few call a big hit. It’s not as iconic or easy to merchandise as The Simpsons, South Park or even the show that (sadly) replaced it, Family Guy. It didn’t have the same mass appeal as its creator Mike Judge’s previous hit, Beavis and Butthead. Some might say it may as well have been live-action. But in many ways, King of the Hill is the best of the bunch. Traditional right-wing American values are under fire just now, especially if you spend a lot of time on the Internet. Many observers, including centrists like me, are concerned by the growing authoritarianism, bullying tactics and outright cruelty on display from the far left, who at some point have to realise they’re not the good guys when they behave just like those they detest. 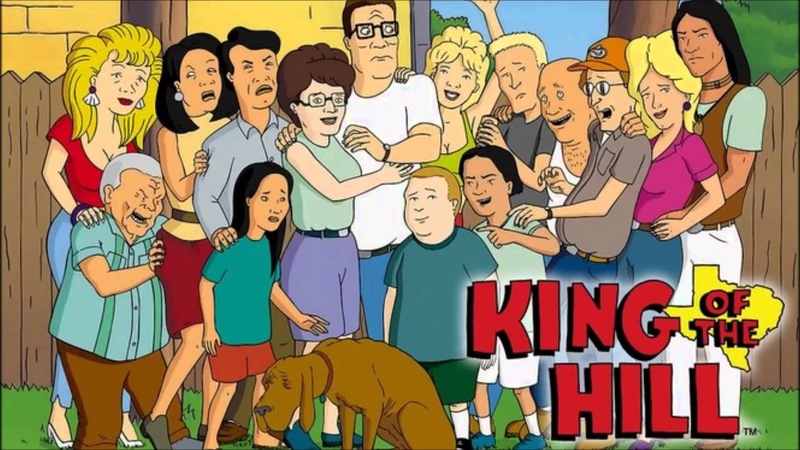 I can’t imagine how that kind of person would perceive King of the Hill. But the whole point of the show is that it’s not a celebration of conservative small-town America. It’s an affectionate lampooning of it. It portrays a traditional Texan community full of xenophobes, homophobes and extremely fragile masculinity, but rather than eviscerating them, it gently exposes the follies and foibles of ignorance while accepting that these kind of people can also be likeable, good-hearted and ready to learn. In a world of safe spaces, echo chambers and thought policing, a show like King of the Hill would be extremely healthy viewing, poking fun at the right and left of the American political spectrum without viciousness. I watched King of the Hill as a child and teenager, but didn’t really get it. I wasn’t familiar with the American small-town mentality, conservative values or particularly Texan idiosyncrasies. A lot went over my head, like that Dale was a conspiracy theorist wholly unaware that he’s being very obviously cuckolded and is raising another man’s son – which should resonate with the so-called ‘alt-right’ just now, with their obsession with ‘cucks’ and tin-foil-hat theories. Rewatching the show now, I’m thoroughly enjoying it. The first season was a short 13 episodes, but it’s quite astonishing how quickly the show not only introduces its core cast, but makes every single one of them both buffoonish and likeable. Hank Hill is such a wonderful character because there’s far more nuance to him than Homer Simpson or Peter Griffin. He’s big and tough but deeply insecure because of his overbearing father. He’s lost in a modern world and terrified of liberal values as well as comically prudish. But he loves his family, wants to help others and wants to protect a way of life he adores. Yet he is constantly challenged, looks like an idiot at first (‘So are you Chinese or Japanese?’) but later actually learns and develops. Peggy is hilarious, sometimes a voice of reason and sometimes dangerously competitive or self-centred with a wonderfully gung-ho attitude to Spanish. Bobby pre-empts the popular character type later seen in the youngest boys of Malcolm in the Middle and The Middle but manages to always seem reasonable in his bizarre behaviour. Luanne is more than token overemotional trailer trash, and has some of the season’s best one-liners, with Brittany Murphy’s subsequent stardom an amusing footnote. Hank’s friends Dale and Bill are classic loser characters, yet each gets moments to shine to lift them from being one-note joke characters. Boomhauer is more one-note but he’s so funny I don’t mind, and mysteriously he also gets the additional character quality of being a womaniser. The Laotian family next door are in many ways stereotypes but are actually very nuanced, fiery characters, each with a lot of distinct personality. The humour largely comes from small-town characters having to deal with a developing modern world and confronting their prejudices, usually highlighting the arbitrary nature of some signifiers of what is masculine or what is American. It’s a healthy examination of a section of society that is as gentle and subtle as it is cutting. King of the Hill is smart and insightful, and right now, it’s more fun to watch its early seasons than The Simpsons past its glory days.